Want to make a commercial for flaming hot cheetos starring Jim Carrey as The Mask? Maybe that’s just me. But if you’re trying to break into commercial directing, you’re going to need a great spec ad under your belt and in your reel. With countless other filmmakers putting out spec commercials to get noticed, it’s more important than ever to give your specs some edge. What does spec commercial mean? A spec commercial is a sample piece of work that shows off a filmmaker’s style, competence, and most importantly, ambition. To “work on spec” basically means you’re working on the speculation that your commercial would be bought. It won’t be, but it looks great in a demo reel. No one is going to buy a five minute commercial. It doesn’t matter if you cast your gorgeous boyfriend in it, or blackmailed your kids to say lines in. If it’s over time, people won’t believe you can deliver the goods. Are you making a spec spot? Then make sure it’s just under thirty seconds. While a page of screenplay is equal to a minute of screenplay time, because you're working on a second by second level, it’s important to map out shots as quickly as possible. Be sure to map out your entire spec commercial into a storyboard and then shot list. You can easily visualize your production at every stage. You can do this by hand, or in free software that allows you to create both at the same time from your screenplay. In StudioBinder, you can break down your spec commercial script into blocked out scenes. When generating spec ad ideas, It’s important to pick a brand recognizable with your audiences. While you may have a hot take on a lesser known brand, the point of your commercial is to get people to imagine hiring you. Taking a brand that people know well offers the opportunity to put a unique spin on the ball. Whether you think they're innovators or just giving rise to Terminator-esque automobiles, everyone know Tesla. In his spec ad, filmmaker Yehonatan Richter-Levin infuses the child-like wonderment of driving a spaceship with a car brand we all know well. Visually stunning and sincerely funny, this spec ad allows Yehonatan's creativity to shine through, since we already know the brand. What makes a good spec commercial isn’t necessarily introducing something unknown to the world. It’s using a brand we recognize so we can see how your talent shines through. Pop quiz: What is a demo reel? A demo reel is where you splice together your spec commercial and a smattering of other projects into one minute sizzle. Many people foolishly ask how to sell a spec commercial. The real question is how can a spec commercial sell you. And the answer: in a demo reel. Before you can put your own personal spin on your spec commercial, you have to know the brand you’re dealing with. Would Cheerios ever make a commercial that’s not about families? Would Old Spice ever make something normal? Because your spec commercial has to feel like it could be real, it’s important to keep your spec commercials true to the brand. If your spec ad has already nabbed you some meetings, make sure you nail down the brand's voice in writing. Directors and creative agencies fill out creative briefs, with designated areas for brand voice, demographics, and timelines to get on the same page. 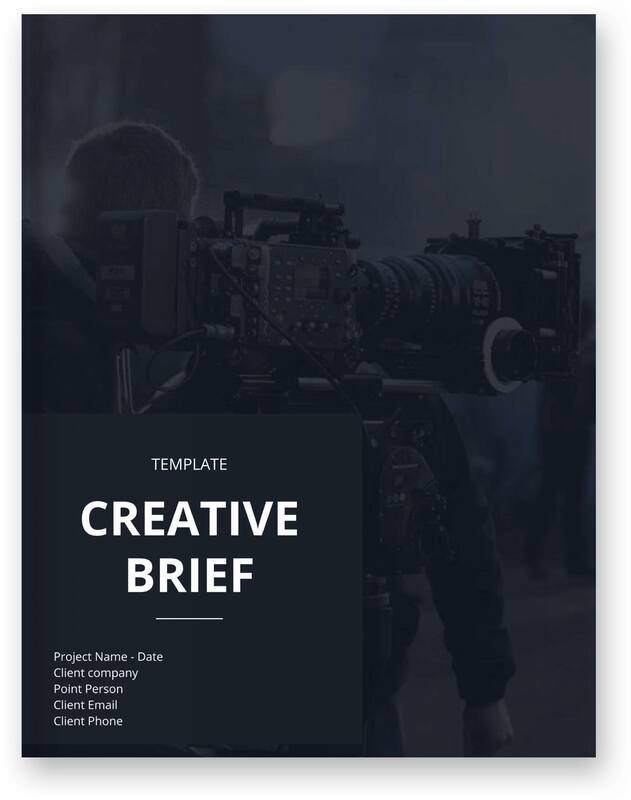 Download our free creative brief template here to make sure don't leave the meeting with more questions than answers. But you should feel free to pivot as well. Risks are what makes a good commercial great. It can be tricky finding that balance between something completely original and something that feels within the world of the company you’re working with. The secret to finding a great angle is often working backwards to a tag line. Before the Betty White commercial, most Snickers commercials were just about dudes hanging out. The decision to infuse the elderly into a spec ad pivoted the brand in a way that only was compatible, but also refreshing. While this isn't a spec ad, it very well could have been, and it's lessons for filmmakers and agencies hold true. Are Doritos tasty? You bet. Do you think the obvious approach is talking about how tasty they are? Duh. Instead of focusing on the general things you’d go on and on to your friends about (the great taste of coke, Polar Bears drink it) the commercial director focused on one thing, and one thing only. From there on out, the rest of the spec commercial took shape. A dystopian world where the worst thing a man can do is fall asleep and Coke is the answer. When approaching your product be sure to find an angle that people haven’t thought of yet. Often, what makes a good spec commercial is a unique benefit paired with that angle. Wouldn’t it be funny if someone said something like “I’m hard...pressed for information!” Or someone was eating something that looked vaguely phallic? There’s nothing that can shoot down a spec ad faster than sexual innuendos and cheap jokes. When making a spec commercial, be sure to always pick the third idea you come up with, not just the first impulse. What is a spec spot other than a chance for you to shine? You made a high octane car chase spec ad, but you really specialize in quick dialogue? When people look to hire you, they want something that encompasses not just what you’re capable of, but what they can expect from you. Your spec ad should be ambitious, but at its core, it should reflect who you are and your brain. It should come across in your storyboards. This spec ad for Adidas went viral when it came out in early 2017. While the spec commercial's origins are a story in its own right, the filmmaker's personal brand of producing heart-warming stories shines through. Instead of abandoning your traditional style to make something gimmicky, embrace your style when you work on spec. So maybe this advice doesn’t apply to your spec ad. Maybe, your video commercial is perfect. And you shouldn’t have to work on spec anymore. The problem then lies in distribution. While most everyone posts their spec commercials on Vimeo and YouTube, you still have to hustle it. One option is to enter a spec commercial contest. While competing against some of the best spec commercials, it gets your name and vision out there. Good old fashioned networking also doesn’t hurt. Our list of the best filmmaking software and resources details the best networking sites to put your spec commercials out there. Got some examples of spec ads, you particularly like? A spec ad portfolio that’s to die for? Share it with us in the comments!